Through sponsorships and programs, we have donated to local schools, charities and other organizations. The Jiffy Lube So Cal Co-Op is a proud sponsor of the Muscular Dystrophy Association (MDA). Every year, MDA holds a summer camp for children afflicted by Muscular Dystrophy. 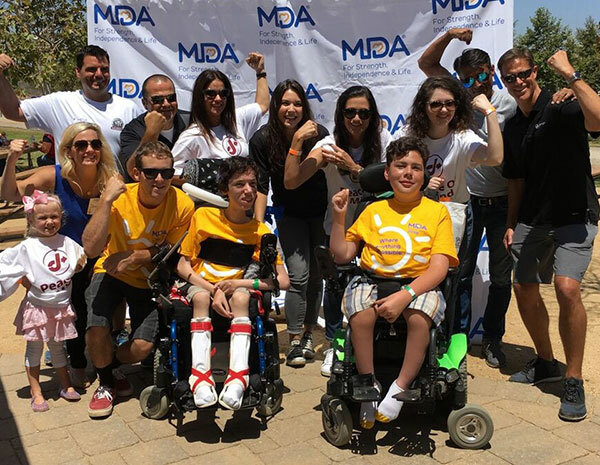 MDA Summer Camp provides thousands of kids with muscular dystrophy and related muscle-debilitating diseases “the best week of the year.” At MDA Summer Camp, kids are living beyond limits in a place where anything is possible. It’s a week where they’re free to enjoy adventures like horseback riding, swimming and fishing, develop lifelong friendships, and build self-confidence and independence. Each year, the Jiffy Lube So Cal Co-Op joins the MDA family for the Summer Camp Sponsor Day. Jiffy Lube So Cal franchisees have a chance to meet and bond with the children they helped send to “the best week of the year. 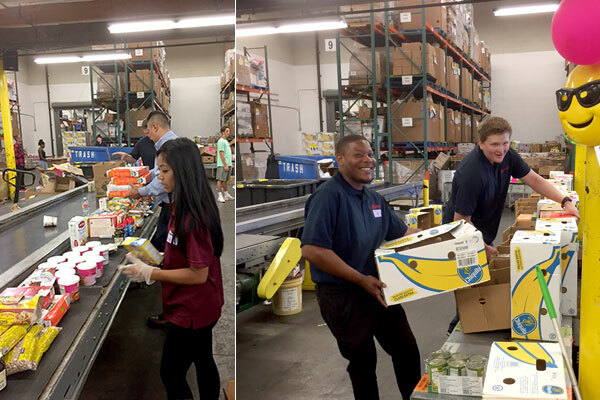 The Alamitos Group, a locally owned and operated Jiffy Lube So Cal franchise, volunteered at the Los Angeles Regional Food Bank to sort and pack food for families in need. They were able to package 7,688 pounds of food equating to 6,381 meals for families in Los Angeles! Jiffy Lube So Cal had the pleasure of sponsoring the 2017 Orange County Ronald McDonald Walk For Kids event! Hundreds of families helped raise money for the Ronald McDonald House Charities by participating in the walk. Jiffy Lube So Cal came out to show their support and cheer along the families walking for kids! 100% of the funds raised helped families with seriously ill children – right here in our local community. 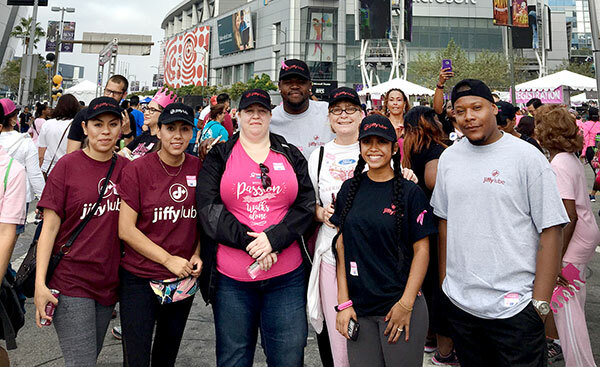 The Alamitos Group, a locally owned and operated Jiffy Lube So Cal franchise, represented Jiffy Lube at the Los Angeles Breast Cancer Walk at LA Live. A special thanks to Jiffy Lube Southern California franchisee Heartland Automotive Services for their support two years in a row. On July 18th, Jiffy Lube volunteers stuffed over 1,000 book bags for the Foothill Family Service’s Backpacks for Brighter Futures program. 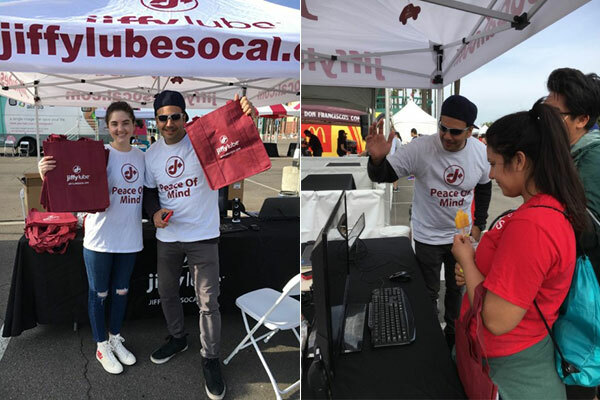 On July 24th the Jiffy Lube volunteers gathered at the Backpack Give Away Fair where the children and families received their backpacks and supplies. This event brought the community together to provide young students from Glendale, Burbank and the San Gabriel and Pomona Valleys with new backpacks stuffed with school supplies, allowing students in need to start the school year with essential tools to help them succeed in the classroom. And last August, Jiffy Lube volunteered at the Family Foothill Services El Monte site where children came to pick up their backpacks for back to school. There were also activities set up for the children such as face painting, bookmark coloring, and writing thank you cards. The Jiffy Lube volunteers had a great time helping the children write thank you cards for their backpacks and to those who have supported the program. Jiffy Lube supports the students in its local community. Robert Curry, Jiffy Lube franchise owner, participated at the Annual Mustang Career Day on March, 28th to talk to the students at Salesian High School in Los Angeles. Robert Curry enjoyed talking to the students about having a career as an entrepreneur and offering valuable advice. Jiffy Lube locations in the Los Angeles area are proud to have partnered with Clear Channel and the initiative Show Your Stripes. The goal of the Show your Stripes campaign is, “to generate awareness around the issue of veteran unemployment, encourage businesses to hire skilled veterans and help those transitioning out of the military find jobs.” We are looking to hire veterans in our Southern California locations. Jiffy Lube joined in the fight against child abuse through our involvement with the Children’s Bureau #thegreatershare campaign. The intent behind this campaign was to create more awareness and conversations about the topic of child abuse. We proudly donated $10,000 to help cover printing expenses, and we hope by spreading the word, we can inspire more people to volunteer, donate or simply share ideas on how to participate in child abuse prevention.